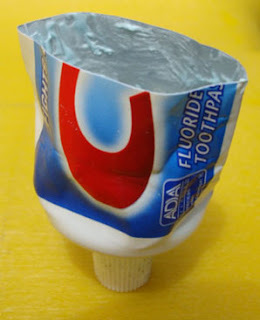 One way to save time and money is to cut your toothpaste tube - just as you finish. Then you can dip out about 5 more brushings' worth. Money? About 1/150 of the cost of a tube. Time? You won't have to rush off to your toothpaste seller as quickly. Ahaaa! This is a brilliant tip. There's always a lot of toothpaste that goes to waste at the end of the tube. Rushing off the the shops in the morning for toothpaste is not too much fun especially when you intend to stay indoors all day. Thanks Paul! Very clever indeed, Paul!! Well, except if you live in a place where ants prevail and would come in droves to a feast like an open toothpast tube. Paul, where do you come up with these things? Going through treasures, part 2: "tapes to make"